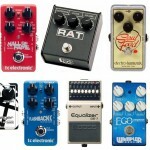 Distortion guitar pedals are a definite must when it comes to building up a guitar rig. 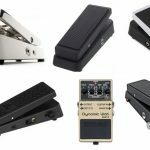 Of course, guitar pedals come in many different shapes, sizes, personalities, sounds, and of course feels, but we know many who typically grab a distortion pedal first and couldn’t imagine a stompbox without one, therefore it being an essential centerpiece for many guitarists out there in the world. 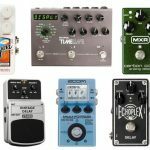 As we continue our exploration into the world of guitar pedals and write these guides on the particular types (having recently completed both reverb pedals as well as delay pedals), today we found 10 of our favorite picks as the best distortion guitar pedals in the market to take a look at. We also provide you our favorite demo of the pedals in order to give you a feel of the sound before you make your purchase. First and foremost when shopping for any guitar pedal — look into the sound! Just because it sounds nicely written up with cool features and the picture is aesthetically pleasing doesn’t mean it’s the best distortion guitar pedal for you. If we were shopping in person at a store, we could always have an employee pull out a guitar and let you play around with a few different pedals. Since we’re online, we’ll have to rely on video demos — but always keep in mind, wait until you hear a sound that really gets you in the stomach is representative of what you’ve been looking for. Next, what type of controls do you mind? Just a simple distortion knob to increase or decrease the amount you have on your strings? Perhaps a filter to play around with? Or maybe even as many controls as you possibly can? We know many guitarists who don’t want that many knobs on their pedal, while others love controlling not only the distortion levels, but also the EQ regarding the low-end, mids and high-end for treble, as well as the gain, etc. We’ll let you decide if this is important or not. Lastly, do you want any additional effects? We’re not talking multi-effects pedals here, but especially with distortion pedals, we’ll find a few paired up with either overdrive, a few with fuzz, perhaps some sustain, or more. Others come with just a simple distortion FX and some controls to tweak the strength of the signal. This will depend on the reader so we’d like to include this in here since it may or may not be of your interest to grab a pedal with more effects other than distortion. Up first as our pick to be the best distortion guitar pedal, the Rat 2 covers many bases for a very affordable price (in fact, at what we consider to be ‘budget-friendly’ when compared to others). Aside from their grimy distortion many love about this one, you’ll also be getting some sustain, fuzz as well as overdrive in case you find yourselves in the mood. The controls are also glow in the dark, which include filter cutoff, volume, and of course, distortion amount. Weighing in at only 2 pounds, it’s going to find very well on your existing stompbox to add that raunchy distorted feel we’ve all come to love. We love it because it’s so straight to the point — just a few controls, simple in and out interface on the back, and of course, a sound many have fallen in love with. 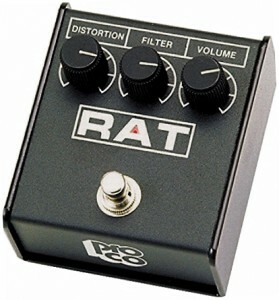 Look in to the Pro Co Rat 2 for a distortion pedal that’s simple, effective and won’t break the bank. Up next, we have a distortion pedal many say they can’t live without, and has become a staple-point in the distorted FX world since it’s so cheap and versatile (and vintage). The DS-1 is just famous at this point, and this is mostly because of the overall feel and sound it produces. First introduced back in ’78, it was Boss’ first distortion pedal ever created. Many famous artists use this or at least have it in their back pocket due to the wide-range tone shaping it provides. The tones are very classic since this is one straight analog with no digital processing whatsoever. Many also use it for a booster at lower distortion settings, but others blast this thing up and let it shred itself. 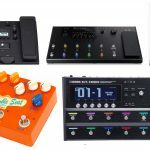 The Boss DS-1 is found in most guitarists rigs or at least deep in their studio on a shelf just to have it handy, and for that one of the best distortion pedals in the market. Let’s talk about some fat distortion and fuzz with this guitar pedal. 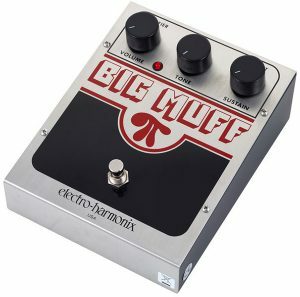 The Big Muff Pi has been used by legends for the past 30 years such as Hendrix and Santana due to its rich sustain that’s been called ‘violin-like’. This is of course a reissue from the 70’s version but we’re happy they’ve made sure not to take away any of the sounds or feel it’s been known for. That warm sound still holds true in this digital-processed day and age. You have three controls on this one — volume, sustain and tone. Sustain helps you tweak the harmonic distortion, and the tone control brings us the ability to sift through their sounds that range from singing high trebles down to the warm bass. This is another highly recommended pick as the best distortion guitar pedal, and we many who can’t go without their Electro-Harmonix Big Muff Pi. Check that sound for yourself. As another one of our favorite picks as the best distortion pedal for guitars, the Dark Matter is quite affordable and brings us some great sound as well as extra controls the others weren’t able to. There’s a big range of distortion tones here, whether you need raw and gritty or some detailed and rich sounds. You can attain a slight fuzz or perhaps a roaring, window bursting distortion if you’re in need of some catharsis. What sets this distortion guitar pedal apart from others however is the shaping of tones and EQ control. Tweaking the gain can help you muddy up the saturation, but you can then use those filter knobs to either boost your low-ends or high-ends separately. We love this mainly for the versatility, and to us and in our opinion, nothing beats being able to have more control over the particular sound we’re trying to find. 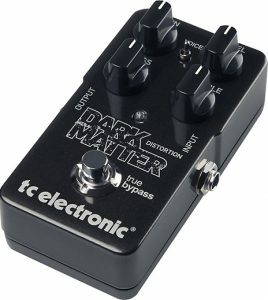 Look into the TC Electronic Dark Matter if of course the sound feels right to you in the demos, but also if you’re one to enjoy more control over their sound and feel. 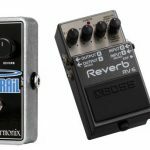 Let’s talk super budget-friendly distortion guitar pedals here, and of course, Behringer is no stranger to cheap gear (regards to price-tag, but not always necessarily the quality). 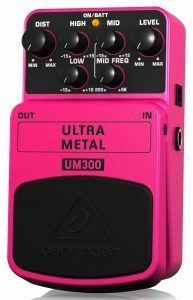 Here the UM300 is for those extreme metal tone lovers, and again we have some excellent EQ control for heavy metalists needing versatility and flexibility in their tones. Not only are we attaining distortion and level controls, but also EQ for both high and low-ends like our previous model. The sound is definitely ‘over-the-top’ some guitarists may say, but others will coin this as the exact pedal they were looking for. Those metal lovers will know what we’re talking about when we say the Behringer UM300 is the best distortion pedal out there. 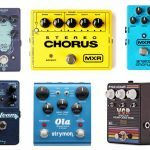 Let’s take a big step up in terms of pricing and overall capabilities when it comes to the best distortion guitar pedals. This is no ‘ordinary’ distortion pedal, or at least for those who have compared the previous picks thus far halfway through our guide. Strymon is known for their more-advanced, digital-based pedals, and the Riverside Multistage does just that — we have controls for drive, level, gain, push, presence, and of course, all three levels of EQ for bass, treble and mids. Now with all of these controls, your sound has some pretty endless combinations. Range from super clear boosts to a very thick sound with high gain that sounds pretty modern in today’s tone world. Although digital-based, the Riverside Multistage does include a mixture of both analog and digital circuitry for the sound processing here. This is where the price comes in — its variable circuit tuning gives you tones that correctable and ‘always-there’ sweet spot, regardless of how much gain you want to slap onto your chords. It’s also compatible with any amp or guitar combo out there. 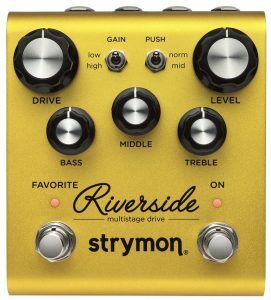 Check out the Strymon Riverside Multistage if you want an advanced and extremely powerful distortion effects pedal. Nearing the end of our guide, let’s talk about another vintage, and pretty much famous Boss guitar pedal with distortion. 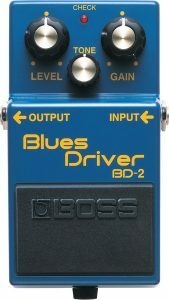 Labeled the ‘Blues Driver’, we have both distortion as well as overdrive effects packed into this one. There’s also some tube amp simulation and that lovely ‘blues guitar tone’ attached to level, tone and gain controls. No EQ here, but keeping it simple with a sound many are in love with, just push that pedal, tweak some of the gain and tone and you’re good to go in finding a sound for you. What makes it a ‘bluesy’ type of sound here is that tube amplifier built-in to the little pedal. This was the common denominator in finding that sound for those blues players back in the day (and now, of course). The sound is rich but can get raunchy if you mess with the settings, and we love the overall dynamic range of tones you can get with this distortion pedal. The Boss BD-2 is yet another one of our favorites to add to your repertoire, especially if you’re looking for a touch of Blues to go with your arsenal. 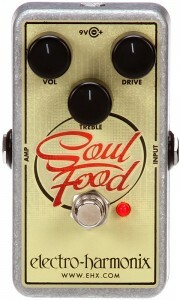 Let’s bring it back down a bit in terms of price to another one of our favorite Electro-Harmonix guitar pedals, the Soul Food. Giving us both overdrive and distortion here, the controls include treble, drive, and of course, volume. What really gets reviews with this pedal however is the versatility. It’s great for adding thickness to tones and rhythms, and including an overall clean boost to help with your sound’s presence. The treble to max does add a bit of a hum, but we know many who actually like that so it will depend on the guitarist. Great AC/DC tone some have said here, and the sound is overall very realistic. The higher drive settings help with mid frequency boosting to aid in tone richness. With such a cheap price many say ‘why not?’ and to just give it a go, especially in the lighter overdrive category. Overall, the Electro-Harmonix Soul Food is the best distortion pedal simply because of one thing — the sound. Here’s another high-end option as the best distortion effects pedal, this time by Bogner with not only a unique sound but also controls at our fingertips. Both overdrive and distortion here, also including 3-band EQ, foot-switchable boost, as well as three other switches — variac, mode, and structure. All of these combine to provide a very heavy distortion with great tone shaping. Overall, guitarists around the culture praise this Ecstasy Red distortion pedal for its versatility with how many types of distortion you can get out of it. You can tweak it to get bluesy or country-like or go all the way up to a heavy, beefy sound for hard rock. It’s very robust and mainly for those who either aren’t sure of their exact sound they’d like to coin as theirs or those who want a mixture of a little bit of everything in their toolbox. 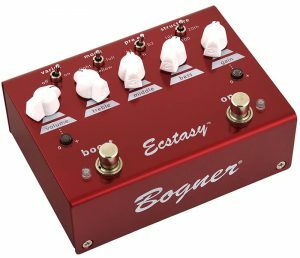 The Bogner Ecstasy Red is powerful and versatile. Last but certainly not least as our final pick to be the best distortion guitar effects pedal available in the market today, the Dracarys is a beautiful choice for those guitarists who want balance. Two types of distortion are included in this one by Wampler — either ‘open’ or ‘tight’ when it comes to selecting its position. Open will give us a very aggressive tone without much compression, while tight has some power in it and a nearly tube-like compression with better lower-gain tone. 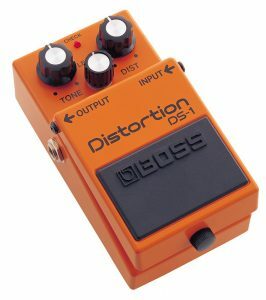 Those who have used this distortion pedal praise the Dracarys for its high gain distortion that is (most importantly) clear and not as muddy as some become with a lot of gain (hence the ‘High Gain’ in the title by many). Use it for slight distortion for a nice touch or get it all the way up to a metal-like shredding. Both modes are great and have been proven to work well, but most importantly that ‘tight mode’ for leads and ‘open’ for less emphasis on the guitar. 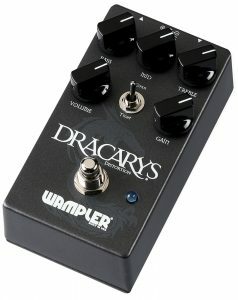 Finishing up our guide, the Wampler Dracarys is a gem.